Developing countries have made considerable progress in raising taxes in recent years. 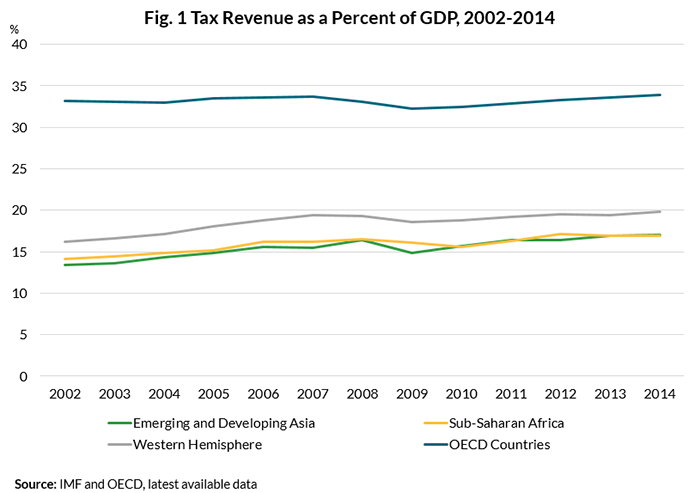 Between 2002-2014, average tax ratios rose by 2.8 percent of GDP in sub-Saharan Africa, and by 3.6 percent in the Western Hemisphere and emerging and developing Asia (see Figure 1). The IMF has long argued that there is potential for generating additional tax revenues in these regions, and since the Addis Ababa 2016 Financing for Development Conference, the World Bank, UN, OECD, and bilateral donors have joined the IMF in support of increased “DRM,” that is, domestic resource mobilization, by developing country governments. A large proportion of revenue gains over the last two decades has come from countries’ efforts to improve the design and compliance of consumption and other indirect taxes, particularly the VAT (value-added tax); in doing so, the objective has been to minimize VAT’s regressive effects by exempting sales of small businesses below a threshold (where the poor typically tend to buy) as well as imposing zero tax on certain food and other products which take up a large proportion of consumption of poor households. Less attention has gone to expanding the coverage of potentially more progressive taxes, such as personal income and property taxes. The challenge of these more equity-friendly taxes is that they have far more demanding requirements on government administration, data and systems than indirect taxes, and therefore are likely to yield less revenue in the short run. In advanced economies, the personal income tax generates somewhat more than the VAT on average; in developing countries the VAT generates more than twice the income tax. We believe it is now time for countries to begin in earnest investing in the systems that support these more equity-friendly taxes. Property taxes consist mostly of annual taxes on immovable property (houses, commercial buildings) and the sale of that property. 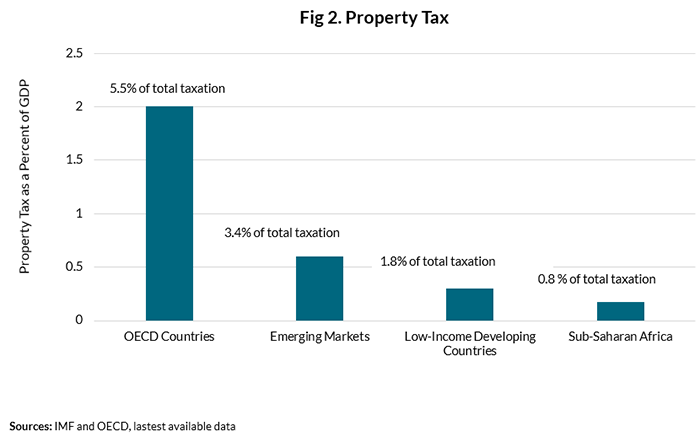 The OECD countries on average generate around 2 percent of GDP in property taxes (or 5.5 percent of total taxes). The average tax-take is lower in emerging markets, at 0.6 percent of GDP (but still 3.4 percent of total taxes—reflecting their relatively lower overall tax/GDP ratios). It is even lower for low-income developing countries at 0.3 percent of GDP (or 1.8 percent of total taxes) (See Figure 2). Over 120 countries have property taxes in place with different tax bases and rates. It’s not surprising that property taxes have been neglected. In most countries, property taxes are collected by local governments—although higher level governments may play a role in their design and operation—where administrative capacity to record ownership titles and collect revenue is not well developed. Good information on property ownership and on the base for valuing property is hard to obtain in developing countries’ thin markets for property transactions. In low-income countries, agricultural activities take up a relatively large share of land area and income derived from agriculture is relatively low. In many developing and emerging countries, urban middle-class property owners naturally resist paying property taxes; that may lie behind governments’ often providing extensive tax exemptions to different classes of property owners (for example, Kenya, South Africa, and Tanzania exempt different classes of land and give the minister and local authorities a wide latitude in granting exemptions). In Kampala, Uganda, the exercise to revise property valuations started last year and will continue until 2019—the last property valuation was carried out in 2005. Against this background, conventional wisdom has been for developing countries to focus on revenue sources with substantially larger potential—at least until administrative capacity, particularly of local governments improved. We urge a revisit of property tax potential, for at least six reasons (and for IMF endorsement, see page 12 of this book). First and perhaps most important: Property taxes are inherently progressive—as Marx observed, it is the rich that own property, and as is the case everywhere, the rich own more and more valuable property. Where income is concentrated at the top of the distribution, property taxes will reduce post-tax income inequality. Income distribution in many developing countries has worsened since the 1980s, though less so than in the US and UK, among other advanced economies. In fact, in all countries wealth inequality is twice as high as income inequality. The sense of fairness matters—including for ensuring tax compliance. There is global consensus that developing countries must raise more revenues domestically to finance priority spending on Sustainable Development Goals, as set forth in the Addis Financing for Development agenda. But tax compliance is a challenge everywhere; the middle classes will accept a rising tax burden, including on their own modest properties, only if they see that the visibly wealthy are contributing a fair share. Second, property taxes can reduce corruption when adequately enforced—adding to the sense of fairness in many developing countries in which the majority of citizens believe their government is corrupt. With rapid urbanization in Asia and Africa in the next several decades, governments will be investing in more roads, mass transit, power and sanitation projects, and public housing. That will raise land values. In the past it is wealthy land developers and political insiders that have too often reaped the resulting enormous rents; a system that imposes property taxes will discourage rent seeking and related inefficient land use as well. Third, property taxes are less distortive; they do not have the bad incentive effects of taxes on labor, and they do not reduce investment. The supply of urban land is fixed and its taxation does not negatively affect urban investment. Rather it creates incentives for land owners to use their land more productively. Fourth, more urbanized cities attract more educated and productive middle-class workers who capture a share of unpriced benefits of urban life, including the rising value of their urban property. From the perspective of fairness, these workers (or their landlords) should pay property taxes (and be subject to progressive income taxation as well). Fifth, property taxes have the advantage of creating accountability to the local citizenry—a political benefit in terms of good governance. And finally, the advent of new technologies means that it is possible to do things now that we could not do as well before. Technological innovation can help overcome the capacity constraints that developing countries currently face in levying property taxes. Property registers can now be digitized, and use of satellite data and computer-aided mass valuation systems can make valuation of property and updates of values cheaper and quicker. Many Indian municipalities are complementing property surveys with satellite imaging to value property with significant increases in revenues. The computer systems are now being used to appraise property values in Slovenia and Tanzania. Of course, we have to be realistic. More equity-friendly taxes face even greater political and technical obstacles to effective implementation as the more tried-and-true VAT (and excise taxes and the corporate income tax). The process of implementing property taxation will have to be gradual, the rates will have to be reasonable—not 10 to 30 percent as in Egypt and Kenya which has resulted in poor compliance—and exemptions from the tax will have to be minimal. But the time for action is now. The IMF, World Bank, and bilateral donors have committed to scaling up their support for building tax capacity of developing countries as part of the Addis agenda. We urge them to ramp up support for strengthening the systems and infrastructure critical to collecting equity-friendly property (and potentially progressive personal income) taxes. Though in some countries it will take many years, the returns (in revenue, a sense of fairness, reduced corruption, greater compliance, and better local governance) can be substantial—contributing directly and indirectly to measurable progress on the SDGs by 2030.